A May 17th article in the Guardian (Pope Francis canonises 19th-century Palestinian nuns, May 17th) included the claim that two Ottoman-era “Palestinian” nuns (Mariam Baouardy and Marie-Alphonsine Ghattas) recently canonised by the Vatican were the the first Arabic-speaking saints in the Catholic church. This isn’t accurate, as there have been previous Lebanese Arabic-speaking saints prior to the recent canonisation of Baouardy and Ghattas – such as St. Charbel Makhlouf, a Maronite Lebanese Catholic priest who was beatified in 1965, and canonized in 1977. 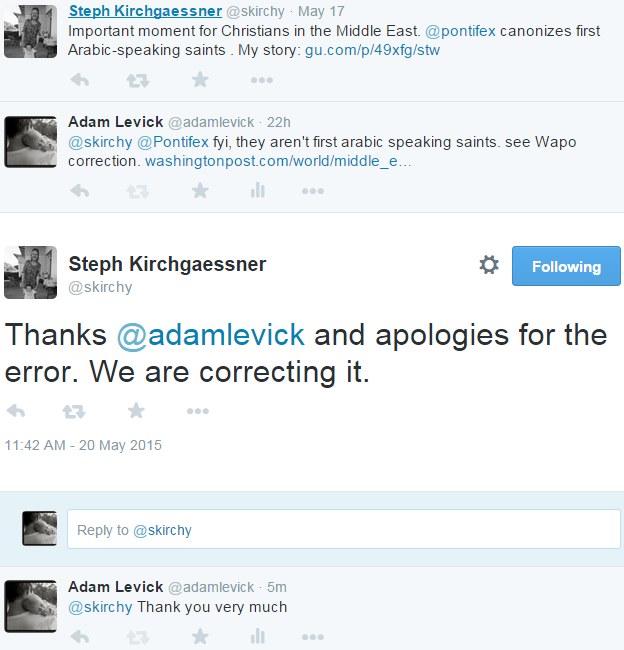 In fact, The Washington Post corrected their original false claim that the two 19th century nuns were the first Arabic-speaking saints. We’ll check to make sure that Guardian editors follow through on the correction, but commend Ms. Kirchgaessner in advance for her positive response to our complaint. UK Media Watch is in communication with other media outlets which made the same error, and will update you when we receive a replies and/or corrections. …which just goes to show how errors and misreporting gets compounded by others because of not making the necessary independent research and checks on accuracy. There is no reason for them not to as this doesn’t interfere with Israel delegitimization campaign.